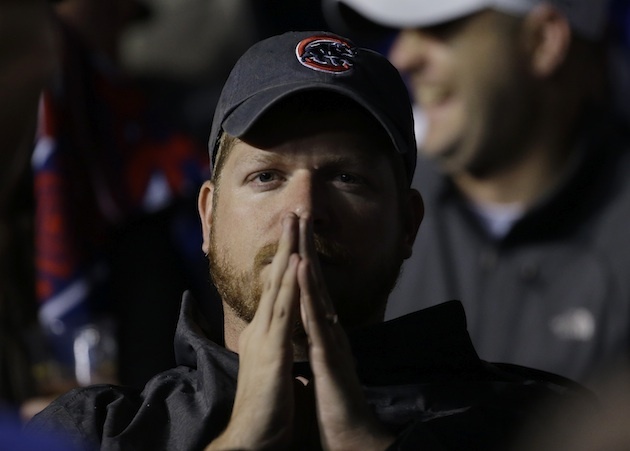 Despite their swift exit in the NLCS, the Chicago Cubs—a team whose fans have long been pulled by competing perspectives and beliefs—are steeped in hope. The right kind, this time. Let me tell you something, my friend. Hope is a dangerous thing. Hope can drive a man insane. It’s got no use on the inside. You better get used to that idea. Ellis Boyd “Red” Redding from The Shawshank Redemption, who might just as well be speaking of being a fan of the Chicago Cubs as much as he is a prison. Many like him have grown accustomed to the scars of prior hopes. 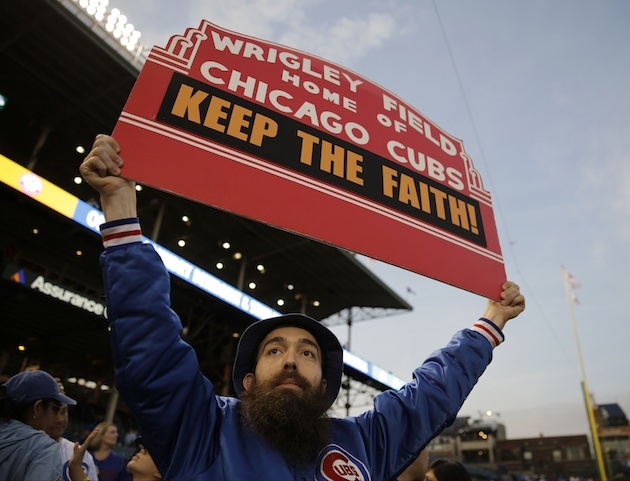 So much so that there’s an annual well-salted resignation to the fait accompli of Cubs futility — a force that works to neutralize the blind faith of that other faction of the Wrigleygoers who can inexplicably wipe their brains clean of each yearly shortcoming. That’s where each side of the North Side psyche stands right now. Following a four-game sweep at the hands of the New York Mets in the National League Championship Series, there are those suddenly aghast that the team they started really paying attention to in September has been so handily shut down—​mostly via whiffing at pitches and a bungling defense, both of which were problems all season. Then there are the “Reds”—the ones who knew they'd arrive at this disappointment; who know in their bones this Shawshank of Cubs fandom is an earned life sentence of sadness one must embrace, rather than fight. There’s also the special group of crazy-embarrassing Facebook friends who put untold energy into “YOU GOTTA BELIEVE” delusions that the Cubs would somehow come back from an 0–3 hole and still win a World Series. You know, the ones who just posted their fifth version of a Back to the Future II meme? That isn’t hope. It’s the kind of stupidity that keeps state lotteries in business. But quietly and patiently, there also sit the Andy Dufresnes of the Cub world. The ones who get Joe Maddon, rather than see him as some sound-bite novelty. Those who heard team president Theo Epstein say from the Day 1 that there’s a plan in place, and that plan would begin to bud... well, now. More importantly, though, he planted the seeds of sustained success — cultivating farm prospects perpetually while utilizing a generous budget to acquire proven talent. These Cubs will be a contender in 2016. An educated guess would say they’re likely the Las Vegas favorite to win the NL. Far more a certainty, anyway, than Anthony Rizzo’s failed prediction that his team would win this year’s NL Central outright (instead, they had to settle for knocking the winner out of the playoffs). They stand to be postseason-capable for the foreseeable future. Of course, the Reds will counter with “nothing is a given,” “assumptions are dangerous,” and other manner of hard-knock wisdom. Scars, after all, are built on such stuff. And anyway, the half-empty beer cup is a favorite angle of local media, who feed the fans who don't understand things like exit velocity. ... There’s definitely a dichotomy with how we’re perceived from the outside and how we feel about ourselves as an organization. There’s a great vibe around here. The sense of progress and potential is palpable. We all feed off that and enjoy coming to work each day, so those questions stand out as being a bit disconnected. Basically: You doubters were wrong, and all of you who don’t trust baseball built on a philosophy of gradual rebuilding rooted in advanced scouting and analytics — you’re idiots. But we, the Cubs organization, aren’t bothered by you. The Dufresnes of Cubdom ignore the mentions of the Edwin Jackson contract, as though an organization is going to hit on every move. Further, they acknowledge that when a team is this smart, its positive moves are bound to outweigh and insure against the negative ones. Such cynicism has become so commonplace, in fact, as to flirt with farce. After laughing and sighing at that, they consider the drafting of “reach” Kyle Schwarber 16 months ago, and how he’s now the franchise leader in postseason home runs. They consider the pick the year before that of about-to-be-named Rookie of the Year Kris Bryant, who the Cubs totally screwed up on by waiting 12 days into this season to call him up in order to have contractual control over him for an extra year. And they consider the big splash signing of a “bust” like record-setter Jon Lester, and someone along the lines of a David Price this off-season to give them at least three horses come next October. The more subtle moves like Chris Coghlan and Miguel Montero. The highway robbery of acquiring Jake Arrieta and Pedro Strop for Steve Clevenger and Scott Feldman, and getting years of Addison Russell and Billy McKinney for months of Jeff Samardzija and Jason Hammel. The plan’s prevalence in the international market which has already produced Jorge Soler and isn’t close to stopping there. 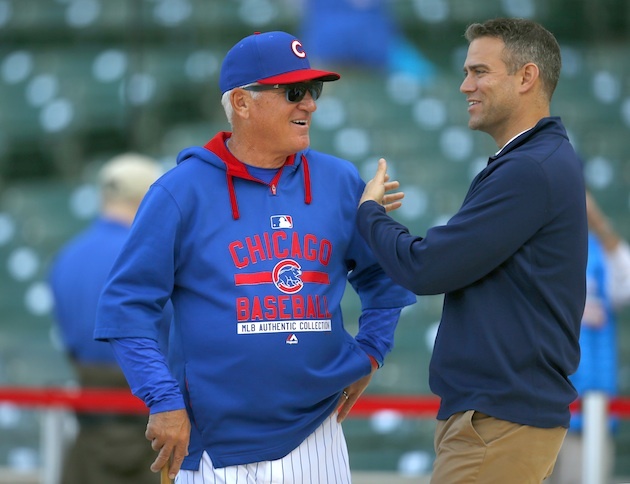 The holdovers from the days prior to Epstein and general manager Jed Hoyer arriving, Starlin Castro and Javier Baez, proving capable pieces whether for the Cubs future or for more stealthy trades. And then there’s the old man of the core — 26-year-old Rizzo — the big-bat, slick-fielding MVP candidate. Plus, you know, carte blanche of ownership coffers to spend whatever's needed to win — today, tomorrow, the next decade. These Cubfolk are about finished crawling through a river of human waste and into the cleansing rain on the other side. Their hope wasn’t dangerous just because that hope was intelligent. They’re prone to neither wait-til-next-year cockeyed optimism, nor bitterness that defines itself by letting losing prove itself righteous. And their past is prologue neither for the near-future of these Chicago Cubs, nor the fans that actually know what’s up. Despite the soreness being felt right now — the pain that comes even with the most improbable of climbs which fail to reach the top — their hope lies not in wallowing in the history, but in embracing its irrelevance. All that, and a firm understanding that 2015 was both a bit of an overachievement, and the commencement of becoming a bona fide force in Major League Baseball, one which will soon be the envy, rather than the laughingstock, of others. These fans and their brand of hope have ditched their prison sentence of assumed curses and lovable losing and are close to their very own Zihuatenejo — to live out their days in a more intelligent, successful Friendly Confines, where the philistine rhetoric of old has been forgotten.